Dina Burstein and Robby Stern garden with ease, whimsy and a knack for making every inch count. 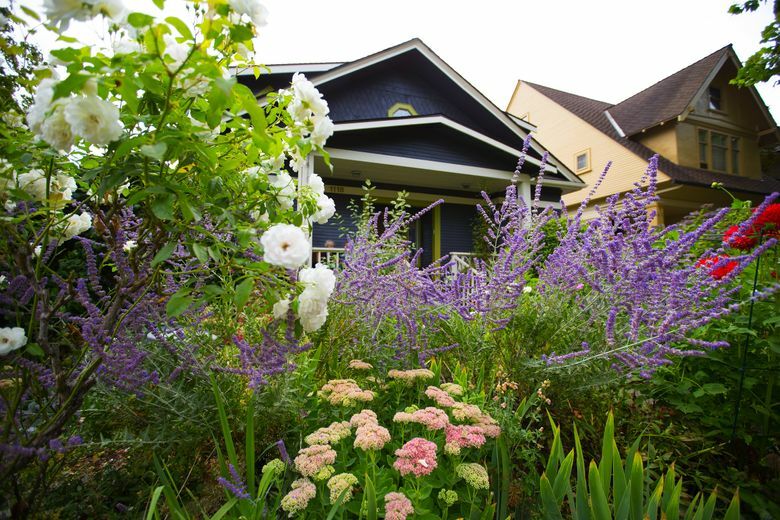 THIS COLORFUL, CHEERY postage-stamp front garden used to be a lawn. The backyard, now full of waist-high vegetable boxes that feed a family of four vegetarians, was a basketball court. Dina Burstein and Robby Stern have been slowly shaping their garden over 20-plus years. 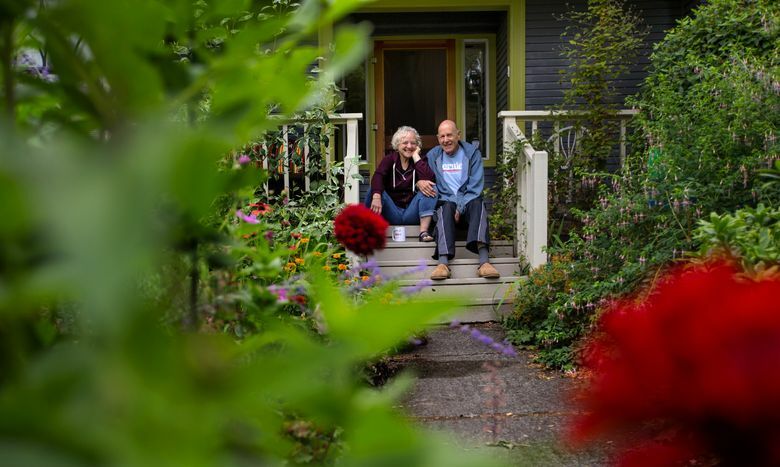 They purchased the home, in the heart of Capitol Hill, in 1989, and it was quite a fixer-upper. After demolition, Robby quit his job to work on it, while Dina worked full-time at Harborview and their children attended nearby Stevens Elementary. “I remember it as a really fun time,” Dina says. In the mid-1990s, after the children had grown and the small lawn was “no longer needed to play catch,” they started the “berm project” — a neighbor’s landscaping friend suggested creating a series of small mounds to plant in. With the close quarters you tend to find in densely packed communities, they received more early advice. “The neighbor across the street was a big gardener, and she said, ‘Whatever you do, build up the soil,’ ” Dina says. Robby cut the sod, flipped it over and poured vinegar on the grass to kill it, and they added compost. The result is a garden roughly shaped into quadrants of slightly raised earth, longer sections to frame these and a parking strip spilling over with plants. The pathways are lined with bark, and a cement walkway takes you through the garden and onto the front porch. 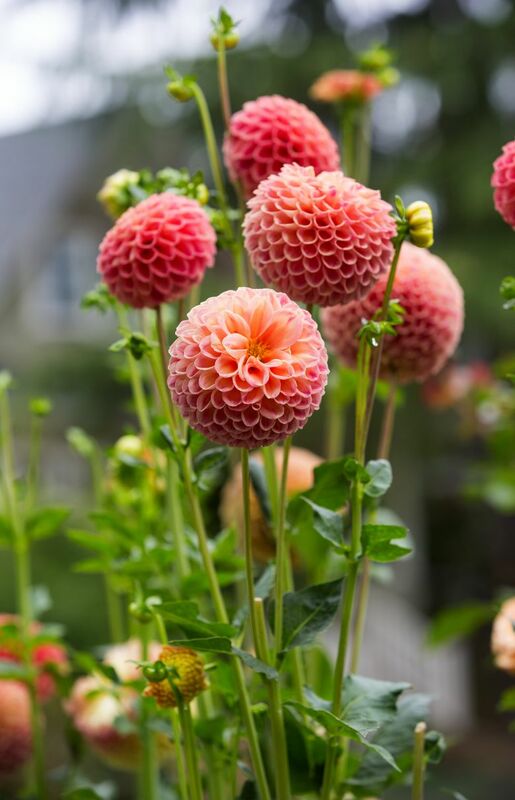 Curated with a seasoned gardener’s eye and a penchant for color and scented plants, theirs is a whimsical garden that has flowers nearly year-round. “We always plan to have something in bloom. 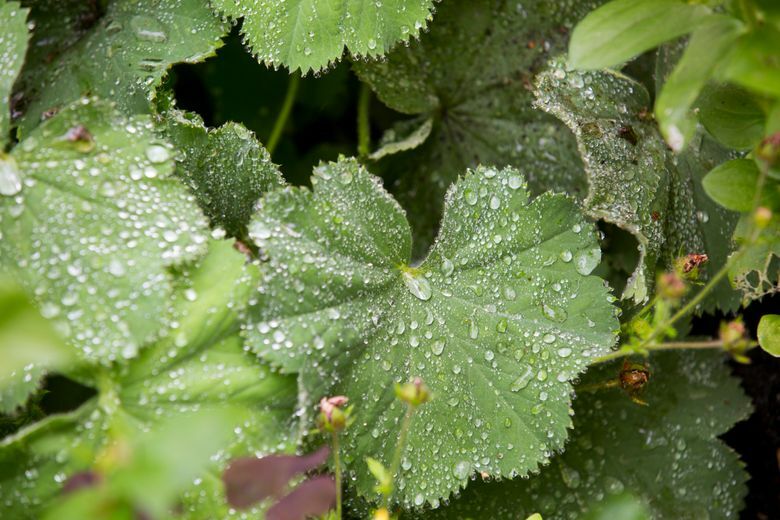 Even in early winter, we have hellebores and beauty berries and heucheras,” says Dina. A witch hazel tree provides winter fragrance and color. It is a compact space absolutely overflowing with plants, small trees and bushes. 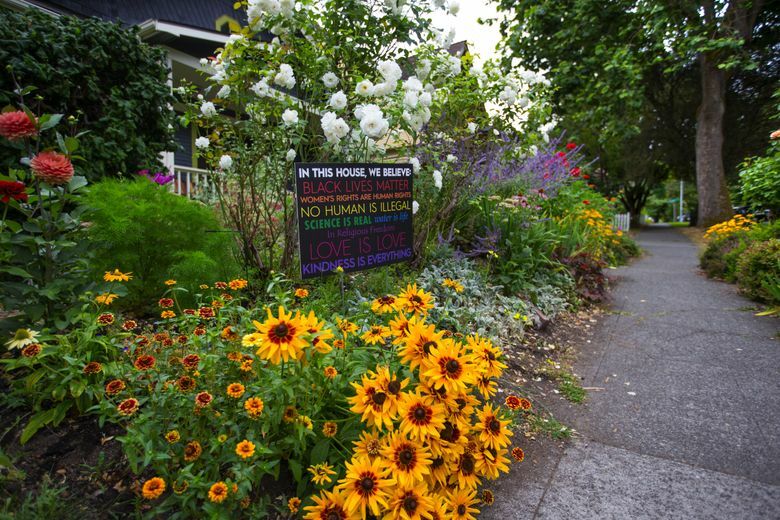 “Plan” is almost a generous word for how Dina and Robby approach the garden. 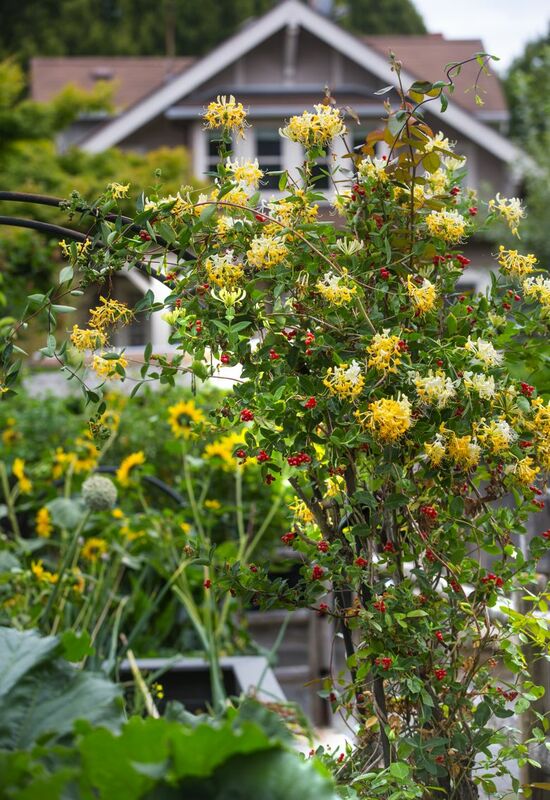 They started with a few foundational plants — several large rose bushes; a contorted filbert tree; and a large beauty berry bush, pruned to perfection and framing the southeast corner of the garden, adding height and a pop of bright purple. They walk through the garden finishing each other’s sentences and sharing memories of what used to be planted here, open to pulling plants out or trying new things. “I am surprisingly willing to give a plant its pink slip if it’s not paying its way,” says Dina. 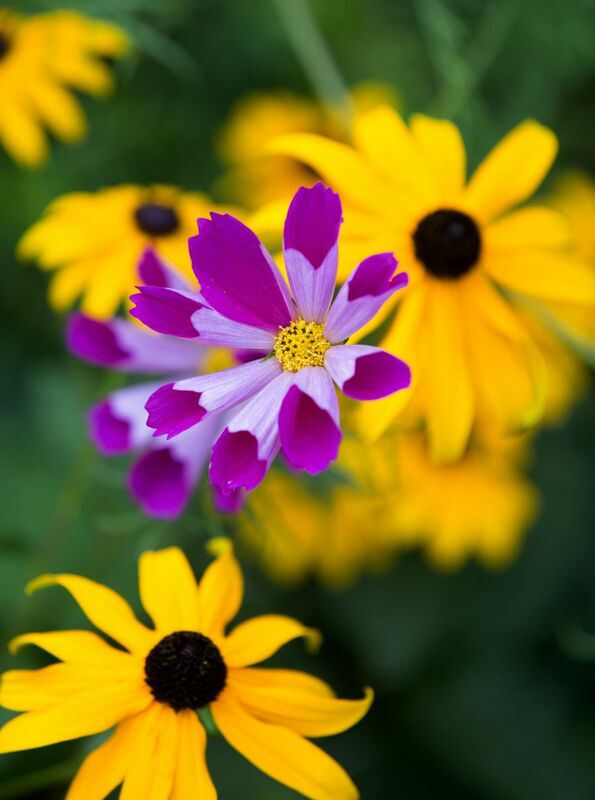 Perennial plants are married with annuals in seemingly haphazard nature. 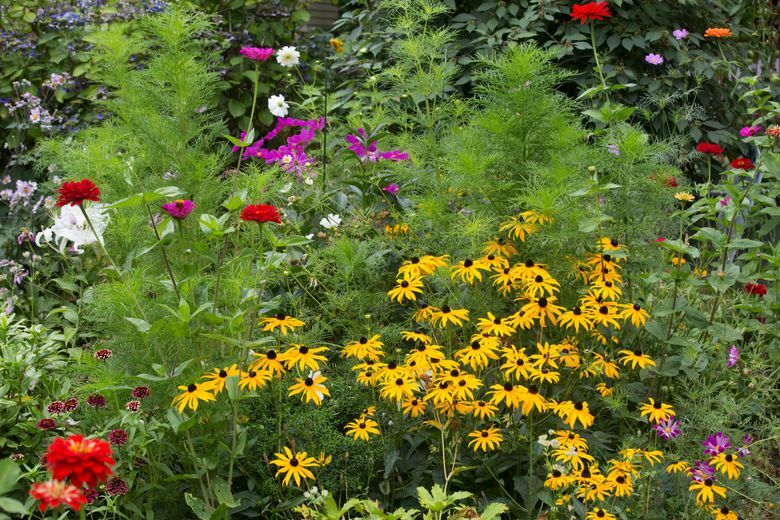 Spirea, heuchera, peonies, dahlias and anemones are mixed with zinnias, sunflowers and clumps of cosmos dispersed across berms. 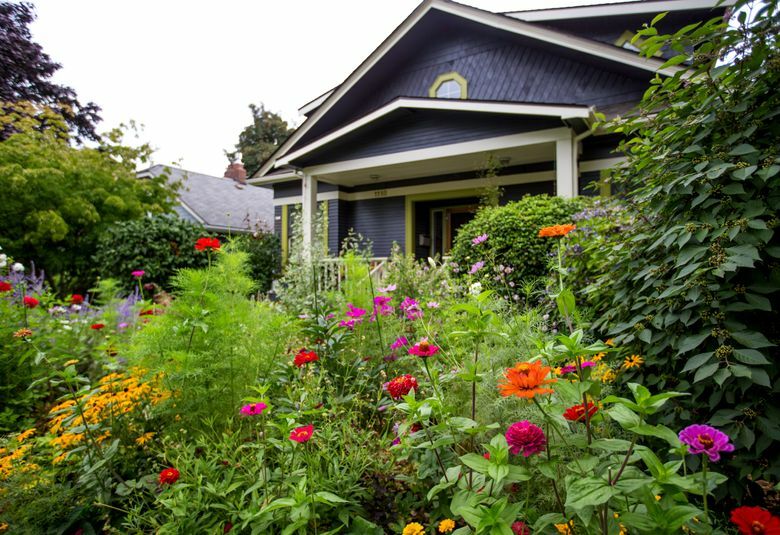 Dina and Robby take note of other gardens around the city and are constantly inspired by plantings. 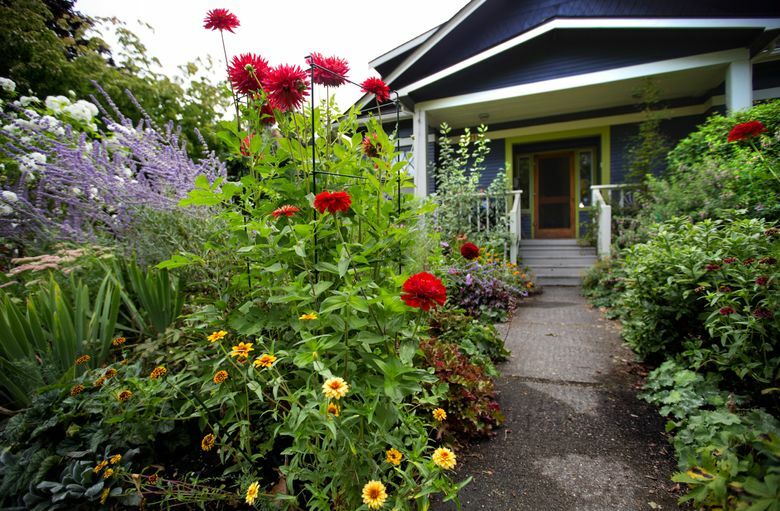 “I saw them (perovskia, a tall Russian sage) at a garden in Green Lake and thought, ‘That is way cool,’ ” says Dina, running her hands across the plant as she walks by. Roses are a prominent feature, no doubt in part to Robby’s past job at the University of Washington gardens. It was there he learned the art of pruning. “I’m the laborer,” he says, though Dina is quick to point out he’s the garden’s master pruner. Three rose bushes adorn the abundant parking strip, the names of which are long-forgotten. A Sheer Bliss rose bush — a beautifully fragrant rose that both agree is “amazing” — anchors the northeast corner of the garden, hugging the porch where the couple sits to have morning coffee. One of the northerly berms is home to Iceberg roses — one of the original plants in the garden that has survived Dina’s discerning eye, despite it lacking fragrance. The backyard is home to the family farm. 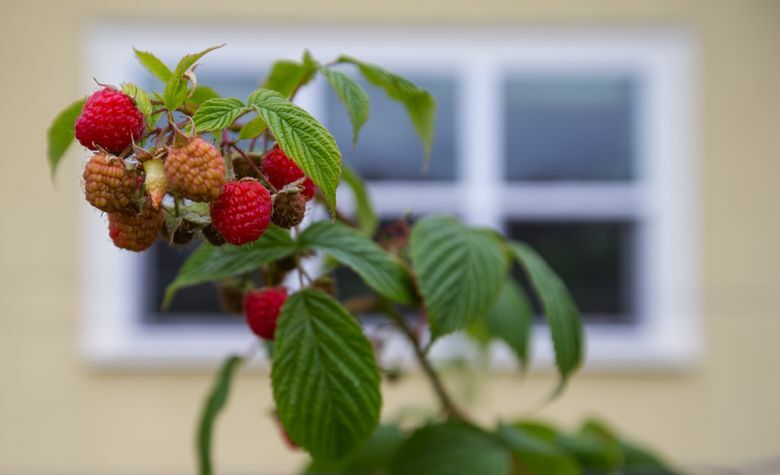 What was once an in-the-ground production planted around the kids’ basketball court has, over the years, morphed into a collection of waist-high garden boxes and a narrow strip of land with a tall trellis for raspberries. This small space supplies all of the vegetables and fruits to the three generations that live here. Working around larger structures like the court and a ramp built for Dina’s father, who lives with them, they started with one large box and had a family assembly line to fill them with soil. This box was so successful, they expanded the tall boxes to the other half of the yard, slowly, over the years. The high boxes will make it easier to plant and harvest. The last box was built in 2015. 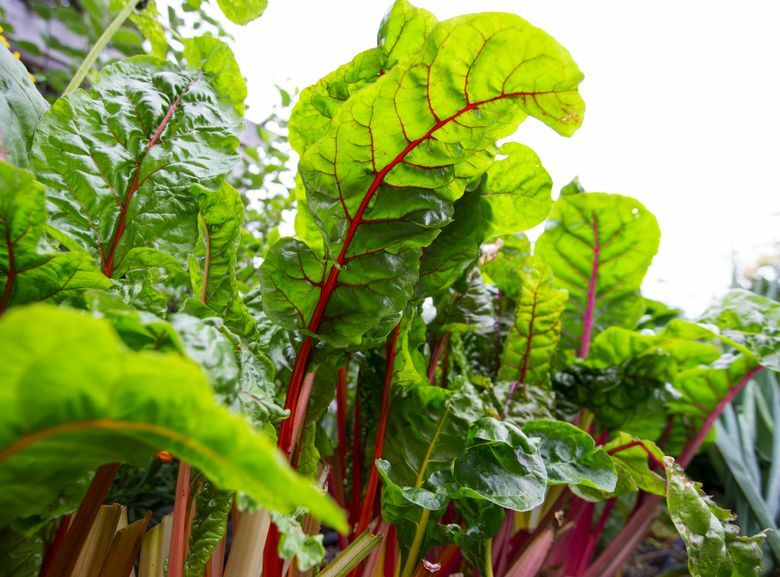 The couple purchases vegetable starts at the Tilth Edible Plant Sale each year — broccoli, chard, tomatoes, basil. Then they order garlic, potatoes and seeds from Territorial Seed Company, poring over seed catalogs starting in January. Starting seeds indoors under grow lights to get a jump on spring planting, “We stumble over them in the kitchen for months in the spring,” Dina says. In cooler months, they extend the season by using cloches, and have successfully overwintered lettuces. 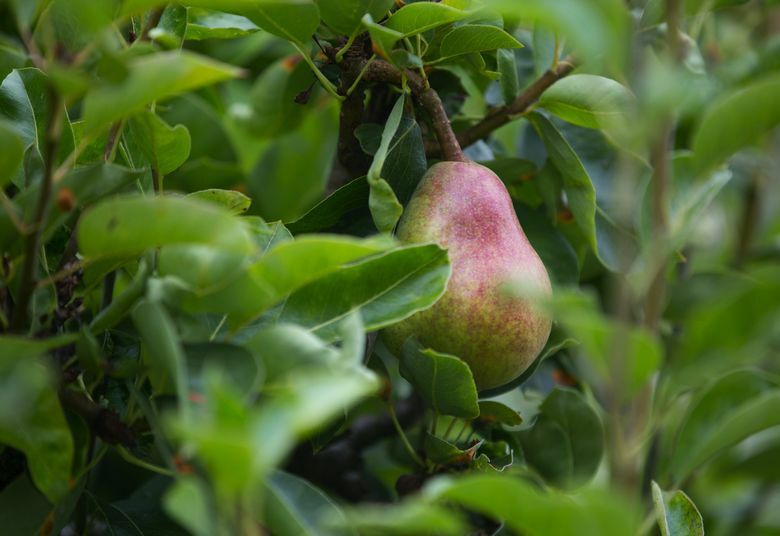 A series of espalier fruit trees — apple and pear — creates a fence-like frame behind the boxes. “The fruit trees have been here a long time,” Dina says. 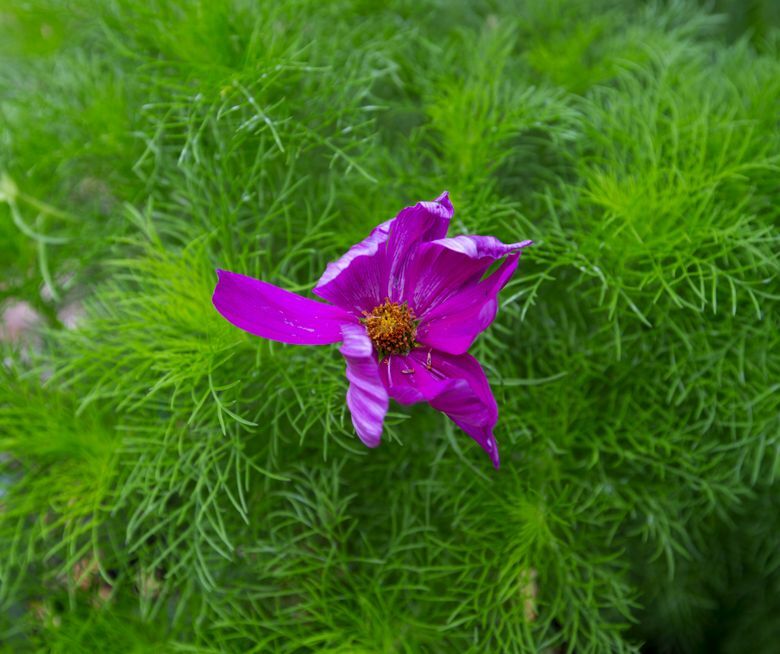 Mixed in to all of the production, fragrant blooms are peppered throughout the vegetable beds. An archway holds a vining, thick mass of honeysuckles — a plant both Dina and Robby loved as children. A trellis originally built for grapes now is home to a Purple Hyacinth Bean plant that weaves up and around a neighboring mason bee box, and is grown as an ornamental. 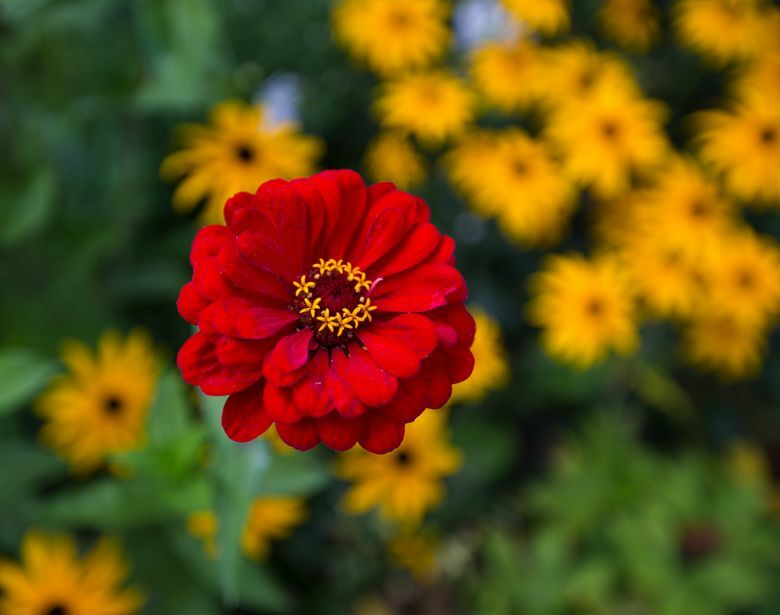 They are out in the garden every few days all year — planting, pruning, tending, harvesting and making themselves available to passers-by for remarks or questions. “We are on the way to an elementary school, and kids walk by with parents, nannies or grandparents, and they’ll ask: ‘What are all the plants that have animals in their names?’ ” Dina says. Even with all the work, the garden is a happy place for Robby and Dina, and they don’t find the light labor cumbersome or draining. They’re happy to be neighborhood fixtures. “This is part of the thing about the garden — we’re out here working in it pretty often, and people just walk by and it makes them happy,” Dina says. 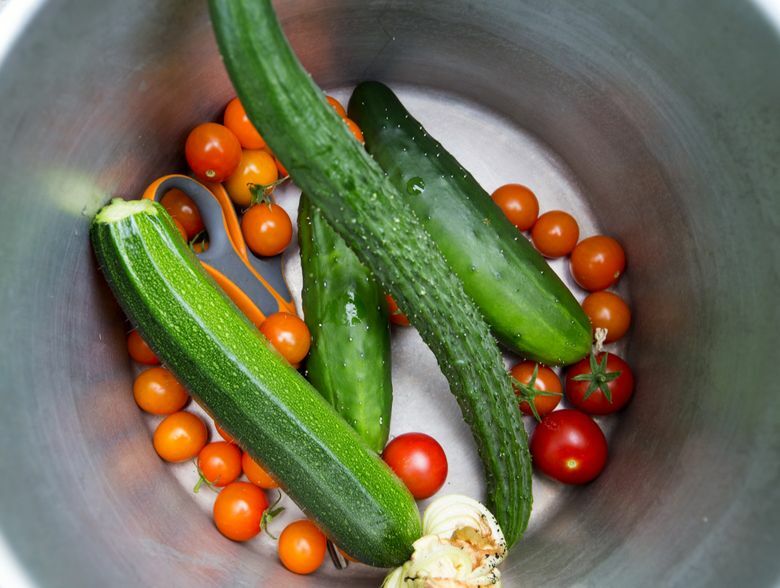 Amy Pennington is a Seattle cook, urban farmer and author. Visit her website at amy-pennington.com.